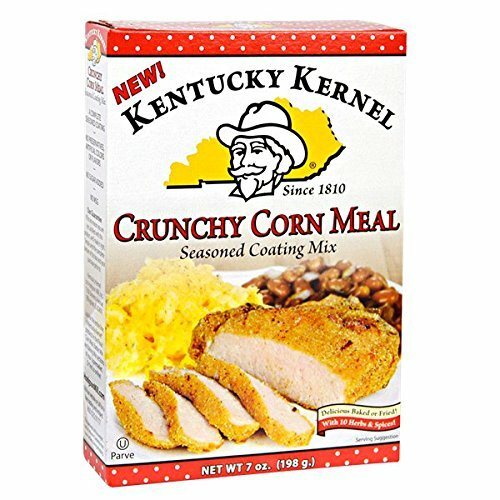 Featuring the signature (and secret) blend of 10 different fragrant herbs and zesty spices, this delicious Southern favorite features the flavor of classic Kentucky Kernel Seasoned Flour, but adds premium yellow corn meal to create a perfectly crispy, crunchy coating for chicken, catfish, meats and veggies. Fry them up in traditional comfort-food fashion, or use an air-fryer or oven-bake for a healthier option with all the spicy crunchiness your family will love. View More In Seasoned Coatings. If you have any questions about this product by Kentucky Kernel, contact us by completing and submitting the form below. If you are looking for a specif part number, please include it with your message. Rotellas Italian Bakery Brioche Bread Loaf - 6 per case. Stevia in the Raw Sweetener Packets, 1 Gram - 2000 per case. Duncan Hines Decadent Triple Chocolate Cake Mix, 21 Ounce - 8 per case. Lindsay Chopped California Black Ripe Olives, 4.25 Ounce - 24 per case. Splenda No Calorie Sweetener Packet, 1 Gram - 500 per case. Lea and Perrins Reduced Sodium Worcestershire Sauce, 10 Ounce - 6 per case.